Tasselnfringe.com specializes in Tassels, Tie-backs, Chair-ties, Key Tassels, Pillow Tassels, trimmings, drapery tassels, Christmas tassels, graduation, invitation / menu tassels, Home Furnishings and Home Decor accessories. Our quality, prices, and selection can not be matched. Manufacturers of tassels, cords, elastics, napkin rings, trimmings, chair tie backs, Our catalogue includes a whole range of beautiful designer tassels and tie-backs To purchase product(s), CLICK "add to cart". When the correct number of items that you want to purchase is in your basket, simply click on "My Cart Positioned on the top of the right side screen". Key tassels are small tassels attached to a thin looped cord traditionally used to add a touch of elegance to cabinet furnitureTassels Trimming Curtain Tiebacks Fringes Decorative Drapery supplier to world. 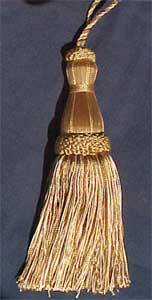 These are our most popular tassels with unlimited uses. Use in your craft projects, costumes, wedding ring pillows, Keys, Dresser drawer knobs, pulls, books, lampshades, chain pulls etc. Light Weight Bookmark Tassels. Tassels for use in Bookmarks. The place for Tassels, Graduation Tassels, Bookmark Tassels, Decorations, Invitation Tassels etc. and Cords for Wedding Invitations, Menu and Program Cards. We also have Trimmings, Fringes etc. We do custom manufacturing to your needs. We make tassels for use with bookmarks. Just Arrived ! Promotionally Priced New Beaded Tassel in beautiful Colors. Browse our newest collection of beaded tassels from Trimindia.com. Hot selling products for Year 2002. At Christmas To liven your spirits & sparkle your home our finely crafted beaded tassels, trims and hangings in variety of designs and colors are very promotionally priced. To liven your spirits & sparkle your home our finely crafted tassels, garlands , trims and hangings in variety of designs and colors are very promotionally priced. Perfect for Home decor & Fall Holiday Season. To liven your spirits & sparkle your home our finely crafted tassels, garlands , trims and hangings in variety of designs and colors are very promotionally priced. Perfect for Homedecor & Fall Holiday Season. Graduation Honor Cord, Purchase single honor cord and graduation tassels at affordable prices. Graduation cords and graduation stole available online at affordable prices. Manufacturer Direct. Great Prices. Quick Delivery. These tassel, tiebacks & cording accessories are excellent accents to homedecor needs. Tiebacks are an integral part of window dressing today, adding a touch of style and class to your curtains.